Aeonium zwartkop growing succulent of the genus Aeonium also known as Aeonium Schwarzkopf or Aeonium arboreum Zwartkop, Aeonium zwartkop perennial evergreen or deciduous used as ornamental drought tolerant plant, can grow in mediterranean, desert, subtropics or tropics climate and growing in hardiness zone 10+. Leaves color black to purple-red, the shape obovate to spoon shape, leaves grow in rosettes shape. Flower color yellow, the flowers grow on inflorescence in the end of the stems in open cluster that create cone shape. Succulent Plant Aeonium Arboreum Alropurpureum or Black Rose Zwartkop, exquisite deep tones of purple with green shading at its center. 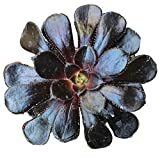 Succulent plant, Black Rose Aeonium Aboreum Alropurpureum. Zwartkop is a beautiful succulent.